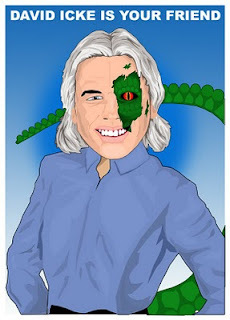 HPANWO: Is it Cool to be Anti-Icke? I've noticed the same thing. I suspect it's a phase, similar to what early adolescents go through with their parents when they start to realise that mom and dad are only human, and won't be leading them by the hand any longer. It's too easy to forget that they were there when you needed them, and will continue to be there for those who come after you. David has gone through a LOT for the sake of truth, and he's done more than any other person I can think of to shed light on dark places. I personally owe him a great big thank you. I suspect that many of his detractors are too young, or too new to this information to remember when he was pretty much the only one speaking about it. He is only one man though, and can't do everything. So of course TPTB have planted their own in his circle, who are busily undermining and discreditting. It's a tactic that works well on anyone who takes an all-or-nothing approach to information. You might mention to your friend that the term "synchromysticism" is already in use. It refers to a particular way of viewing reality and culture, similar to divination or dream analysis. It's practitioners make note of synchronistic appearances of symbolic themes, tracking them and speculating on their meaning. Hi Muluc. Thanks for your comment. I'll mention to Marmite-Lover that her term is not original. If you look at the HPANWO Forum you'll see that the main anti-Icke brigade are people who used to be "devout Icke disciples". I put those words in quotes because David's message is that NOBODY should ever become a disciple or follower of him! Anyone who hangs on his every word has missed the entire point of them. He says as much in as many words: "If something I say doesn't sound right to you- ignore it!" Just like that. This is what I have done. I've listened to him, I admire and respect him, but I'm definitely not a "follower" or "disciple" and this is what he wants other people to be. The problem is that for people who DO see him as a "Guru" and "Messiah", when he fails them, by for instance not giving them spoon-fed answers, in their immature minds they feel betrayed and rejected. This is why George Gurjieff was often very harsh and decietful to people he was teaching. It was a way of preventing them becoming TOO fond of him! He was trying to give information without breeding dependence and helping his students stand on their own two feet. Excellent blog. I see my wife has added her comments. I will just mention how much I admire his dedication under duress. We update his site almost daily and find great value in his work. That's a really good point, Ben. Responsible people who have a lot of important information to share will often say, "Don't believe me," and they really do mean it! Sadly, it seems as though many people hear those words and then think something like, "Oh, he must be trustworthy or he wouldn't say that, so I can believe whatever he says." They're most often right in believing that they're not being lied to, but everyone can make mistakes. Personally, I'd be horrified if I thought that anyone believed everything I said just because I said it. Your an incredible writer Ben, I wish I could write like this, jeeze louise. Thanks, Mark. Glad you like my contribution to the Blogosphere. We must live like a burn! And it will not have time. And then life will end. "Dedication under duress" or defication under a dress? ?